The husband is on his second (at least) holiday party of the year. 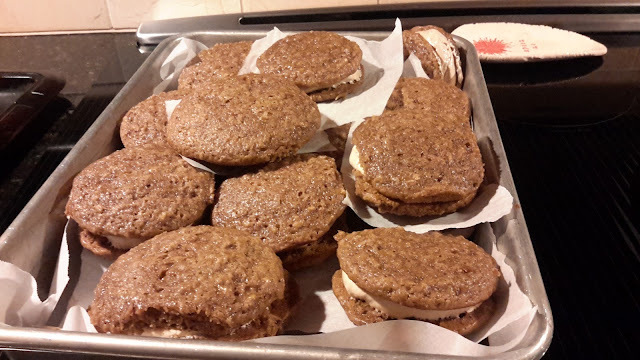 So, he got the wintermint cake and these whoopie pies. Ok, I will admit, that even though the recipe says in bold print 2 different times NOT to use imitation maple extract...I used it.... it was all that I could find and I had 2 containers left over from a cinnamon roll bake off 3 years ago...so, alas, I did not follow the recipe 100%. That being said, these were not bad. I have an aversion to maple syrup in general, especially the fake kinds. So, after eating one of these to see what they tasted like, I had enough. The cookie part was quite good - who can go wrong with 2 cups of brown sugar?! - but the filling was quite fake maple-y tasting. He took them to work, and like a good husband, came back with only one left for himself for dessert after dinner :) They went over really well, he said. And I am happy to have them out of the house as I have 16 more recipes to make in 16 days! Oh and there was leftover filling, so I popped them in the oven at 250F for an hour and wala! Meringues! :) Husband likes meringues. This recipe was a win win for him. 59 DONE. 16 remain. sooooo close! This weekend is going to be a cookie baking frenzy!